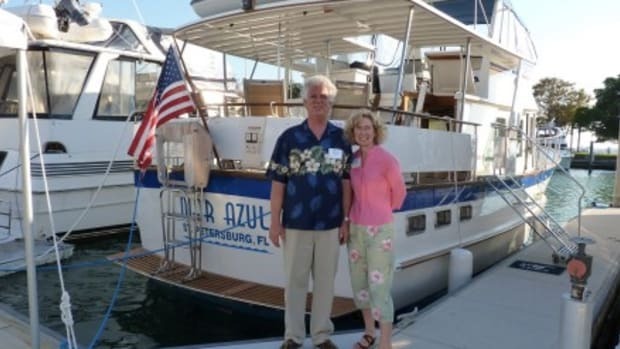 Follow along with Bob and Elaine Ebaugh aboard their 1985 DeFever 44 Mar Azul, as they spend two years cruising the waters off of South America from April 2011 through June 2013. 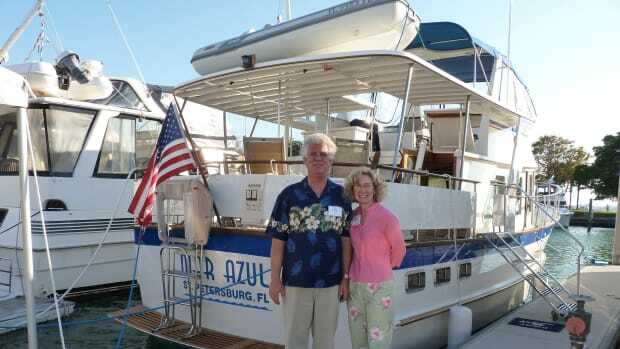 To learn more about Bob and Elaine as well as their home afloat click here, or visit their blog, here. We had beautiful weather forecast with minimal winds and low seas for departure from Provo on the 16th. Leaving South Side needed a high tide exit with our 5 foot draft. 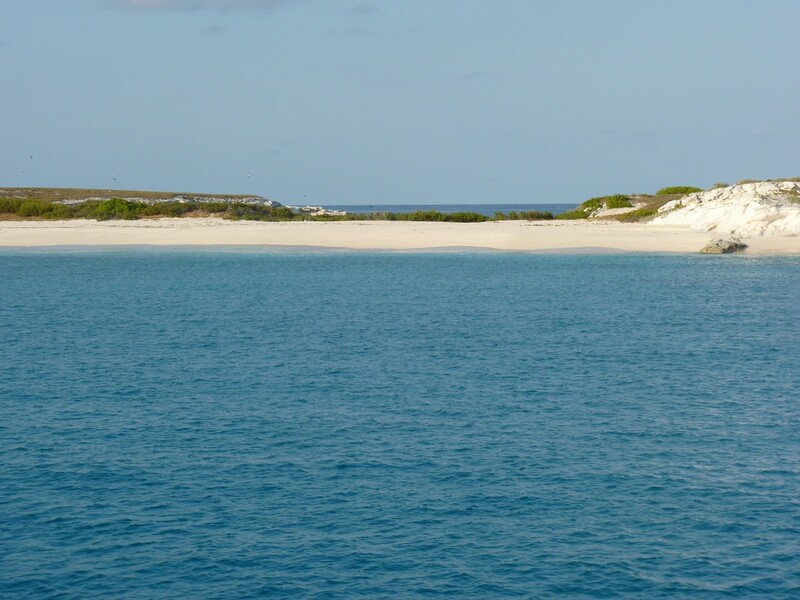 Crossing the Caicos Banks, an unmarked, shallow body of water scattered with coral heads, required daylight conditions for the 70 mile/10+ hour trip. There were no anchorages until we reached the Turks Islands at the end of the Banks. Customs & immigration rules stated that once we checked out of the country in Provo we could only anchor at an uninhabited island on our way out, and there were no other locations en route to handle the customs process. Customs rules don’t take into account all of the complexities of safe navigation in a slow moving boat. The cruisers advice we were given was to be safe first, and plead “mechanical problems” in the unlikely event we were challenged in an unauthorized area. 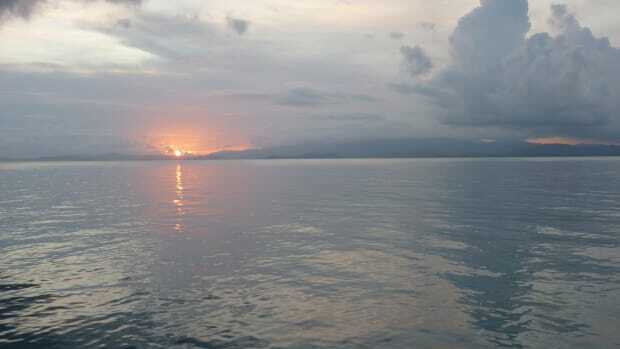 Approaching the lush Hispaniola Island. The tides were in order for a 7 am departure. The Perle left South Side with us, and took a more northerly route across the Banks with their shallower draft. They planned to head directly to St. Martin, a 5- day non-stop trip. We saw only one other small powerboat the entire day until we reached Big Sand Cay, where two sailboats were anchored. Big Sand Cay is an uninhabited park island with a lovely beach, although difficult to access via dinghy with the surf. The anchorage was scenic, but rolly, and provided a nice break after a long travel day. We swam the dogs and celebrated our anniversary with a hot meal, then decided to continue through the night to Luperon for a morning arrival. Big Sand Cay provided a stop en route to Luperon. The terrain in the Dominican Republic, with mountain peaks and lush green hills is much different than the flat sandbars that make up the Bahamas and Turks and Caicos. 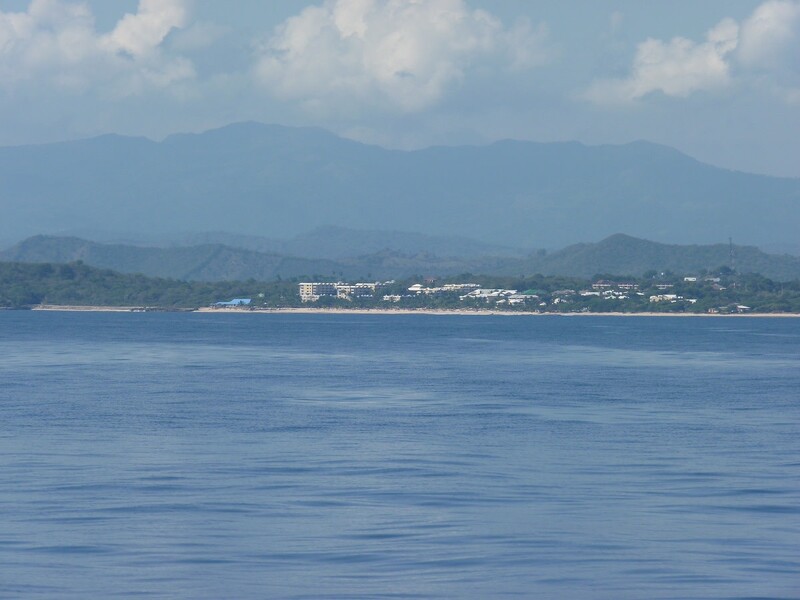 We could see the clouds marking Hispaniola all the way from Big Sand. Luperon harbor is well protected from the open seas, and considered to be a “hurricane hole”. 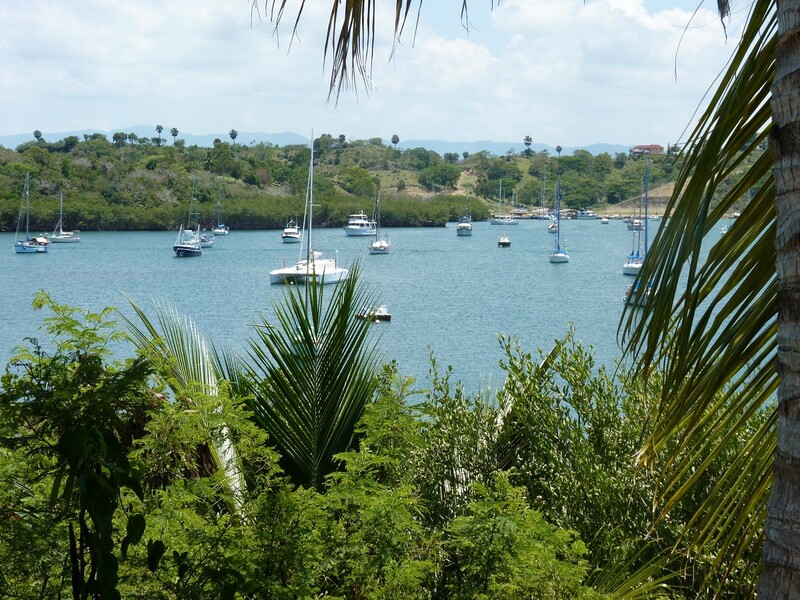 It is smaller and more crowded than we had envisioned, with over a hundred boats here including cruisers en route to and from the Caribbean, locals, and cruisers who choose to spend the season here. 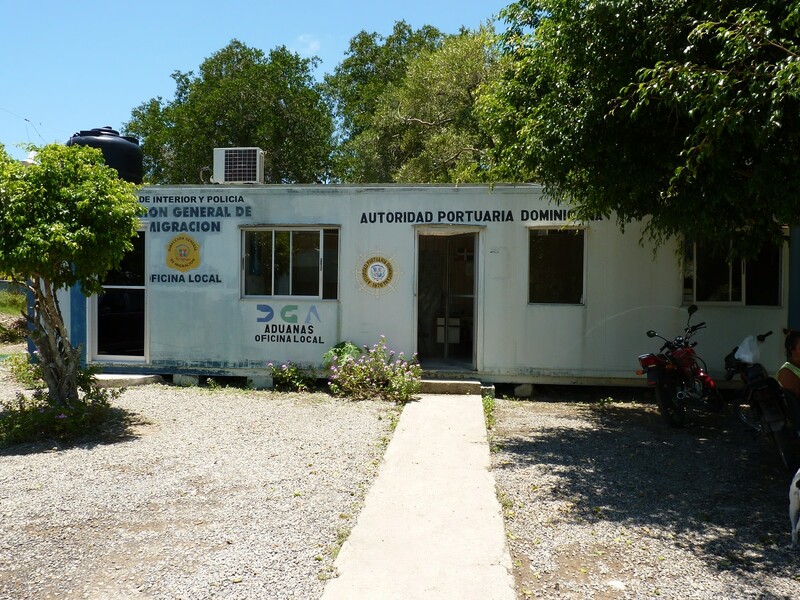 Luperon Customs Office was our first stop, then a trip up the hill to see the Port Captain. We flew the yellow quarantine flag on arrival and made breakfast while waiting for the officials to visit. At 1 o’clock, no one had visited other than Pabo, a local who offers boat watching, water, fuel delivery and other services to those in the harbor. Bob went ashore and visited the different offices to handle check-in. He brought back the Port Captain and another official who boarded the boat and went below briefly to determine the number of cabins and take a quick look around. They were pleasant, and spoke little English. We speak little Spanish, so the communication was limited. We kept the dogs out of their way, passed the inspection quickly, then Bob returned the officials to shore. It seemed practical that they use the cruisers dinghies for transport when possible to keep their costs down. 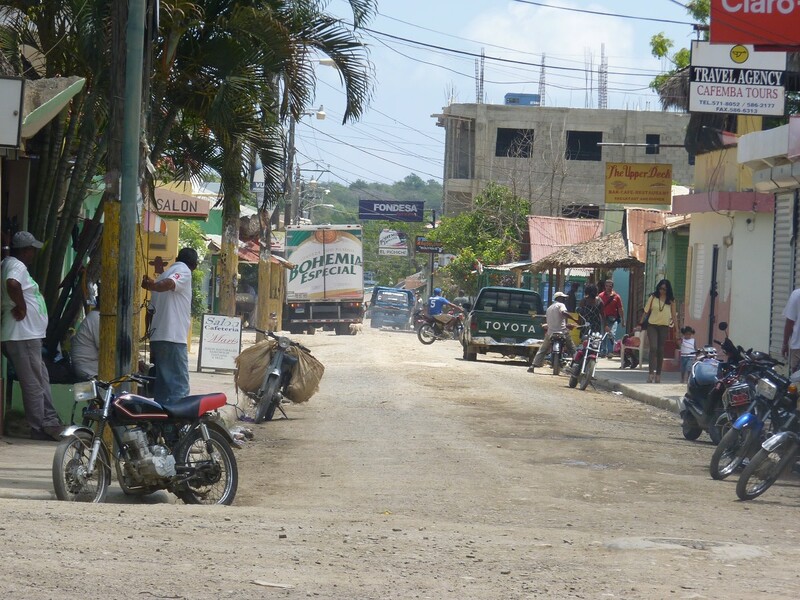 The next day we explored the town of Luperon, with a population of about 4300. Compared to the quaint Bahamas out islands, and more cosmopolitan Providenciales, downtown Luperon offered a glimpse at a very different culture. 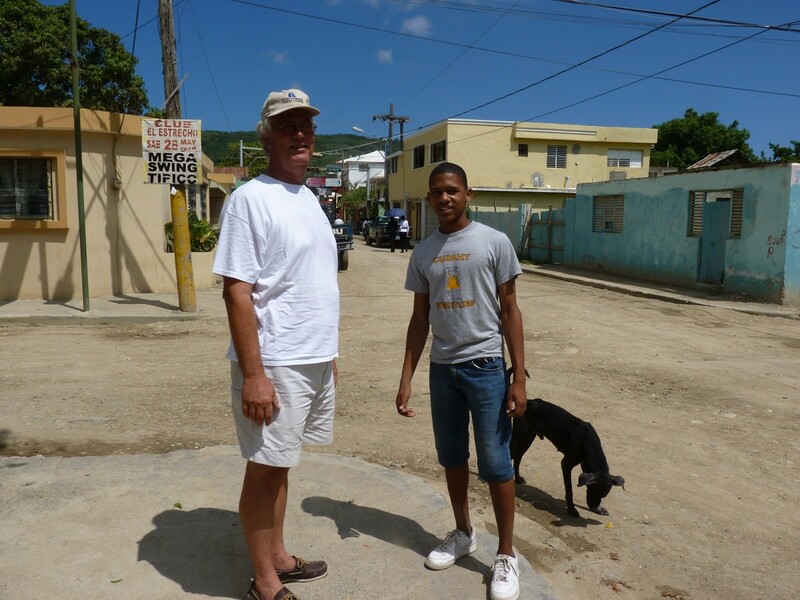 Julio (right), our tour guide and Bob. We were quickly identified as newbie gringos, and Julio, a friendly young man who spoke English, became our self-appointed tour guide. 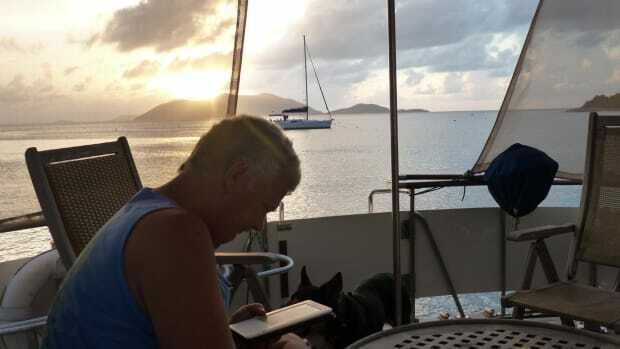 He pointed out the shops, ATM, and helped us find the Internet service provider we had identified from the boat, but could not access online. Most people get around on scooters or small vehicles, and many had cell phones, including Julio. Small boats were rowed around the harbor and had no motors. The downtown interestingly had concrete sidewalks with unpaved streets. We saw several schools, surrounded by high fences and barbed wire, a Catholic church, restaurants and bars, several small pharmacies, three dental offices, a hospital and the town cemetery. The lush countryside is ideal for growing fruits and vegetables, and the DR is fairly self sufficient in providing food for the population. Numerous vegetable gardens and fruit trees can be found in town, and beautiful produce is readily available for sale on the streets. Local production keeps food prices low. Breakfast for two plus a large beer (yes, beer seemed a good, safe choice) was 250 pesos, about $6.50 US. A huge pineapple, delivered to the boat by an industrious young boy, rowing a boat he had handcrafted himself, was 60 pesos, less than $2. 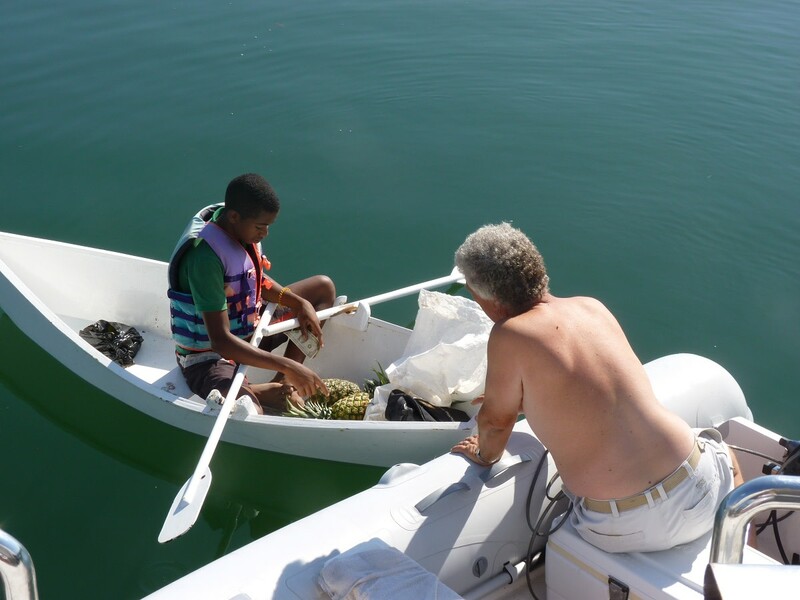 Fresh pineapple being sold boat to boat. Sanitation precautions seemed lax, with the market’s wastewater openly dumped in the streets. The restaurant rest rooms had toilets only, with a common sink outside for hand washing and a shared hand towel. 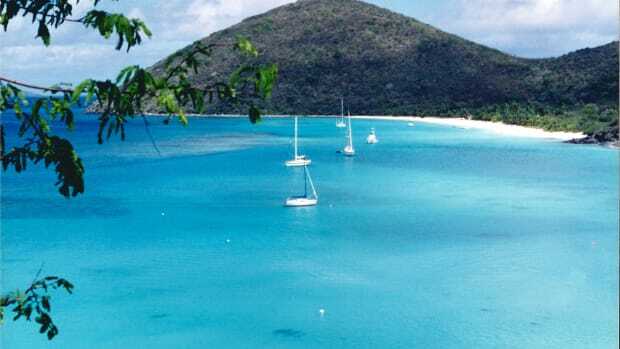 On the cruisers net they mentioned recent reports of cholera near Santa Domingo, the capital city on the south side of the island, and an Internet search confirmed this concern. I am more at ease dining on the boat, where we make our own fresh drinking water, and where I know how the food has been handled. From a safety perspective it feels comfortable here, and everyone is friendly. Some minor crime was reported on the cruisers net, including theft of gasoline from dinghies. We broke out the dinghy lock to better secure the dink to the dinghy docks and to the boat at night. We don’t feel the need to haul the dinghy up each night for security, as will be mandatory in future destinations if we want to keep our dink. We figure the dogs will alert us to anyone who approaches the boat while we are sleeping at night. Luperon Harbor, Mar Azul is in the background on the right. We scoured the area to find a suitable place to take the dogs off the boat, and finally found a small dinghy dock away from town that permitted access to streets in a more remote residential area. I wasn’t comfortable taking the dogs into town and exposing them to the lack of sanitation and animals on the streets. While we people know not stick our noses into garbage and eat goodies found on the streets, dogs don’t seem to have that knowledge. Elisabeth from the Perle told me her dog had gotten sick after getting into rat poison that was left openly on the street in Grenada. She sought immediate medical treatment from the well-known veterinary school clinic on the island. However, the dog developed fatal kidney problems as a result of the poisoning. Other than the challenge in providing adequate exercise, I think the boat is a safer place for our canine pals. We plan to be here for another week or two, and hope to meet up with Doug, a friend who will be here to kiteboard in nearby Cabarete, one of the top kiteboarding destinations in the world. 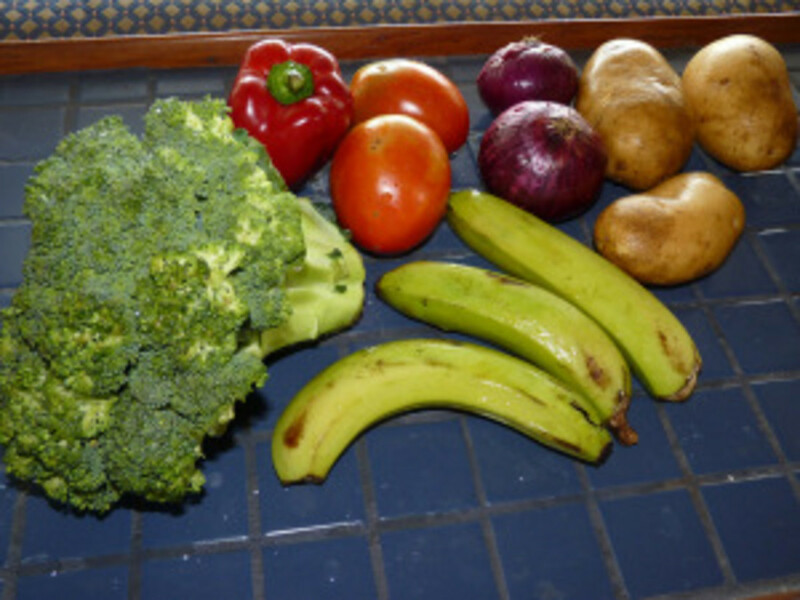 100 pesos worth of produce, about $2.65 USD. Ventured into town today for the 7 am weekly vegetable market. We were expecting a large assembly of vendors in the town square, and didn’t see any activity, so inquired at Captain Steve’s, a local restaurant. It turned out we needed to go a few blocks farther, and look for one truck along the street with produce laid out on tarps. One man handed out small plastic bags, and people stuffed them with like items, and weighed some of them. Another man sold plantains, and a woman had loaves of bread for sale. It was hard to figure out who was in charge, who to pay, and who to negotiate with. I had my notes in Spanish, including all the numbers I am still trying to memorize. We were the only tourists there. We observed for awhile, and I gathered some items, then a man approached and asked “Finito?” We figured out the damages, and the vendor used his calculator to show the total, which helped the communication. I had been told that gringos wouldn’t get the best prices, although I think we did okay even with poor negotiating. Later, we saw various trucks loaded with produce going up and down the streets, stopping at the restaurants, where the restaurant owners and other patrons could make purchases. We went back to Captain Steve’s for another 100-peso breakfast. One of the specialties today was pineapple-mango juice, made fresh to order, and it was delicious. 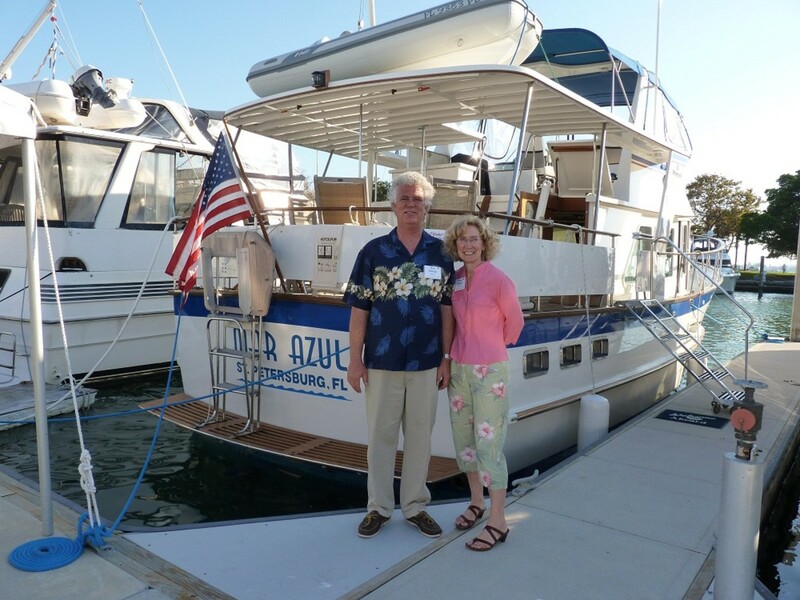 Captain Steve and his wife, Ana, speak good English and try to cater to the needs of cruisers. They have free Internet onsite with lots of plug-ins for laptops. He has a small indoor pool, about the size of a therapy pool that is sparkling clean. (You don’t want to swim in the harbor here for obvious reasons.) He sells supplies, including limited groceries, and makes arrangements to get certain items upon request. He suggested we visit the local stores for some things, where he said we would get a better deal. He seems to work hard at keeping a reputation for being fair and honest. He described business here as highly competitive, and it has been impacted over the past couple of years with the world’s economic woes. 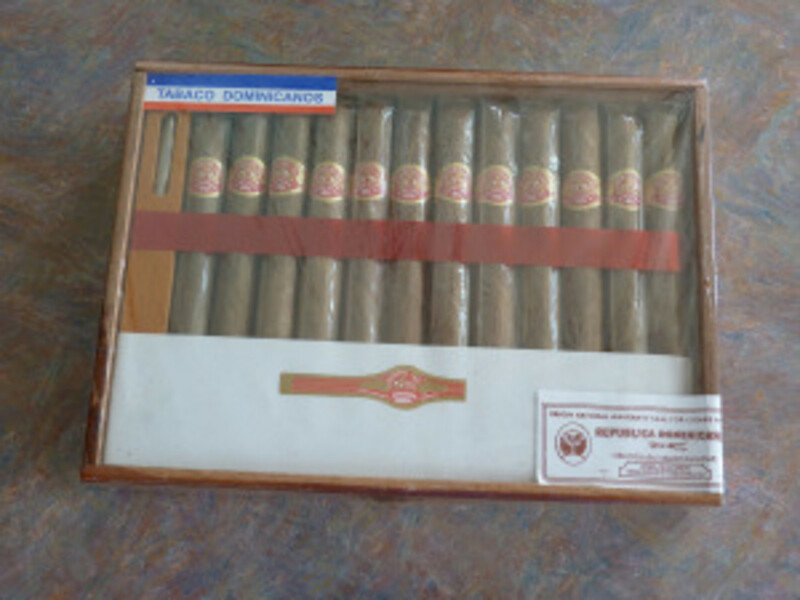 Bob bought a box of local cigars that supposedly rival Cuban cigars for $15 US. We don’t know anything about cigars, so hope they are good! They were highly recommended. Those will eventually make their way back to the states to a cigar-smoking friend as soon as we can figure out how to ship them.